9 out of 10 Fridays we have Pizza for dinner. It is just our tradition. Sometimes we make our own, sometimes it is just a pizza from the freezer, and if we are lucky and Hubby has been working downtown than it is a pie from Home Slice. 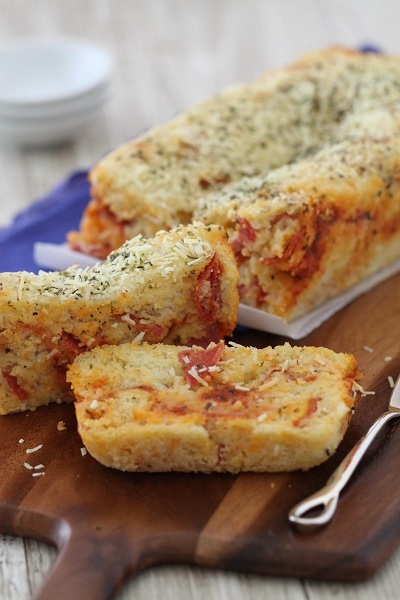 But next week I think we might try a nice salad and a loaf of this Cheesy Pepperoni Pizza Bread from Picky Palate. And I know at least one sauce hater that will probably love it more than any other Friday pizza night. You can get the recipe for the pizza bread HERE. Oh, YUM! We just finished a huge pizza ourselves, and I STILL want this! I will be making this for dinner tonight I think.